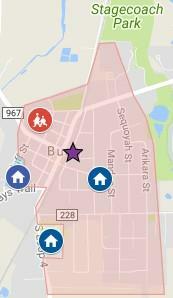 Here's an interactive search map with Active MLS listings of Homes for Sale in the Downtown Buda Area. Call Jim at (512) 913-1557 for an appointment or with a question. Neighborhood Location: The Downtown Buda Area is shown in the image to the right. This area includes a number of small subdivisions (see info later on this page). From IH-35, head west on Main ST to the main part of Buda. The data in the following table presents a snapshot of Downtown Buda Area real estate activity over the past 8 years. Downtown Buda Area real estate market data is from the Austin Board of Realtors 1/1/2011-12/31/2018. The homes in these several neighborhoods were built over many years by a number of home builders. The most common small subdivisions included in the data and home search are Bonita Vista, Pinafore Park, Sequoyah, and Severn. Other neighborhoods are Chandler, McElroy, Ferguson Estates, Village at Buda, Downtown Buda Historic District, Howell, Original Town of Buda, Eggleston, Possum Trot Park, Mountain City Oaks, and Double R.
These homes range in age from 1895 through 2015, and include homes ranging from 560 to 2,896 sq. ft. of living space. Most of the homes in this area are single-story, but there are some 2-story designs. Homes in the Downtown Buda Area have 1-4 bedrooms, 1-3 baths and 0-4 garage spaces. Many of them have had updates of some sort through the years. Lots in this area typically go from 0.07 acres up to around 0.75 acres. Downtown Buda Area Amenities, Shopping, Parks, Schools, Taxes etc. Shopping Buda Cabela’s outdoor sports store, WalMart, HEB grocery store, Walgreen's, and a lot of eateries (Logan's, Chili's, Arby's, Dan's, Cracker Barrel), e.g. The Downtown Buda business district has restaurants and small businesses. The City of Buda offices and Municipal Library in Downtown Buda are being moved when the new building off Main ST is completed in 2018. Kyle Kyle Crossing, Kyle Marketplace, The Village at Kyle, Kyle Town Center. Super Wal-Mart, Lowe's, Target, Home Depot, Ross, HEB and many others. Medical Kyle Seton Medical Center Hays. Hospital located in The Village at Kyle. Schools Hays County Hays Consolidated Independent School District. Since attendance zones are occasionally adjusted, parents should check with the school district to verify the schools their students will attend. A new high school is being built along FM-967 on the west side of Buda. Taxes Buda The primary taxing authorities are the City of Buda, Hays County, Hays CISD and the Austin Community College.